What did you do, wake up this morning and say, "Today, I'm going to ruin a man's life"? Title Designer Nina Saxon has worked on the opening and closing sequences of hundreds of films and television shows, but one of her first major projects was working with Michael Douglas and Robert Zemeckis on Romancing the Stone. The action-adventure comedy was a surprise hit for 20th Century Fox, who had such grave doubts about the film that after seeing a rough cut, Zemeckis was actually fired as director from another film, Cocoon, which was then under development. However, Romancing the Stone wooed audiences with its thrilling heists, vibrant jungles, and colourful characters and was a box office smash, propelling its lead actors, Michael Douglas and Kathleen Turner, into stardom. The success of the film also allowed Robert Zemeckis to make Back to the Future the following year, which was an even bigger smash and again featured the work of Nina Saxon in its gripping opening sequence. A discussion with Title Designer NINA SAXON about working on Romancing the Stone. 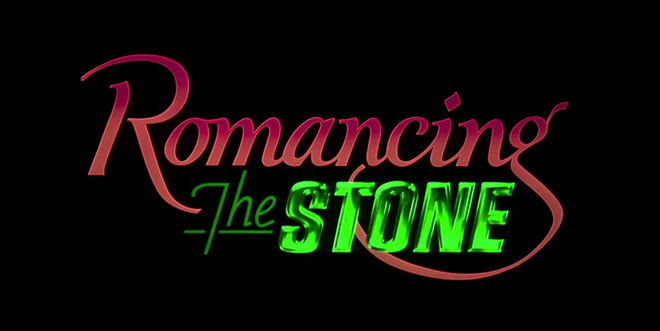 Romancing the Stone was one of your first title sequence projects, right? How did that come about? Nina: Bob Zemeckis was doing the movie, as the director. It was his second film, and I’ve done all his movies since including Flight and Forrest Gump. He’s just as loyal as the day is long! And that was how I started. What was Zemeckis like to work with? Michael Douglas really wanted it to look like a romance novel. 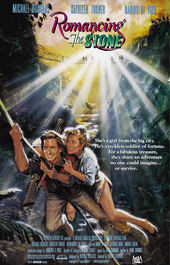 For Romancing the Stone, that was primarily the logo reveal and the typography, right? Yes, it was a logo design, and originally the publicity department was designing the logo, just in black and white. It had a lowercase “R”. Michael Douglas really wanted it to look like a romance novel. And that makes sense because of the plot. Yes, exactly. So Michael pulled me into those meetings, to direct the person in the publicity department. But Zemeckis didn’t want to do that. The whole beginning scene is Kathleen Turner, she’s writing something, it’s this whole scene over sand, which is what she’s writing. And he wanted it just to – the type to blow in and blow out, but Michael Douglas was like, “No, it’s my movie, sorry, do not listen to him.” [laughs] So I had to walk that line with them, too. I would say, you know, “Bob, this is really becoming more of a branding issue for the movie – for the books, for the cassettes,” and so he got out of the way. He focused on the film. Michael got his way. What was the process that you used to create the effects on the logo? How did you do that? I worked for a man named Robert Abel, and he had developed a process called “Painting with Light”. It’s a process where the light’s projected under the camera, all the art’s black and white, and you cover up different areas, and you learn the names of all the filters, like a 47 is a deep blue, and a 16 is green. Robert Abel was an American pioneer in visual effects, computer animation, and interactive media, best known for the work of his company, Robert Abel and Associates. Therefore, you can create a logo in 17 different colour variations with different coloured bevels and hairlines and present them to directors without making coloured art! And it’s so luminous, it’s not like what you would do today on the computer. It was great. So, I did that on Romancing the Stone for Michael Douglas. I had to make my own deal on that, which was a big deal, but he’s only eight years older than I am, so he was scared! [laughs] So I went to publicity meetings with him and figured out what the logo should look like, and supervised people doing that at 20th Century Fox. So I supervised it and then using that technique, painting with light, I made the “Stone” emerald green. You know, it could’ve been yellower green or could’ve been bluer green – and I did that. Then I came up with the typeface for the rest of the credits that went over [Kathleen Turner] in her living room with her cat, and then the end credits. And then I went on and I did the sequel for Michael, too. The Jewel of the Nile. Did you have the same process for that? Same process. It was just a real gift to me as a designer, because nobody else knew how to do that. Only [Jewel of the Nile] was not a good movie! Lewis Teague directed it and he was not a match, and the script wasn’t good, and the truth is – and it’s true of anything anyone says of any movie – if you don’t have the screenplay, and it’s not a good screenplay, the movie’s not gonna be good. It has to start with the bones. So that’s how I got started, and I just started hustling after that. After Back to the Future and Romancing the Stone, it wasn’t that hard for people to trust me. Those two movies, Romancing the Stone and Back to the Future, launched my career.